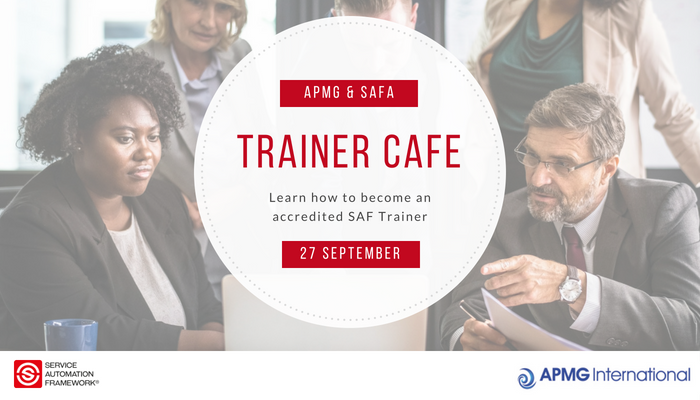 Following the announcement at the recent International Away Day, APMG-International and the Service Automation Framework Alliance (SAFA) are happy to confirm the time and the agenda for our first trainer café event on September 27th, 2018 in Huizen, The Netherlands. Please pass this invitation on to your Dutch APMG accredited trainers. It’s an event dedicated to them. Just to recall: As APMG we have always focussed on the quality of delivering trainings and evaluated trainer’s skills and knowledge. In the past our Away Days have covered a lot of trainer relevant topics, but with the growth of APMGs portfolio and the diversity in our industry these have been superseded by marketing and operational topics. The trainer café is an initiative for all our trainers in the Netherlands. It is intended to become a platform for trainer relevant topics, starting from sharing training practices, pass rates and performance, didactical methods and more up to in depth information about new qualifications and initiatives. We value your feedback and we think you will value the feedback of your peer trainers. For the kick-off we have invited José Stijntjes to share her knowledge about the Service Automation Framework Alliance (SAFA). I saw there maybe a typo on the announcement of the SAF trainer cafe. Is it 27 or 29 September. This shows in the Linkedin version of the announcement. I may visit this event, time permitting. Thank you for the comment and the sharp observation. The announcement on LinkedIn did indeed contain a typo and the the Trainer Cafe will be hosted on the 27th of September.